Autistic Spectrum Disorder or Autism is a development disorder. Children affected by this disorder have difficulty with communicating and interacting with others as their behaviour is rigid and they generally prefer a routine and repetitive behaviour. Datin Grace Lee is to the right of Roland Hifler (centre). Extreme right is Michelle Cheng. Most times parents discover that their children are autistic after they start school and only realise the fact when their child is unable to cope with the basic school syllabus. Parents with autistic children have come to realise that autism is a journey requiring much navigation. Realising their reality, a group of parents formed a support group, ASAP or the Autism Support Association for Parents to share experiences and resources. 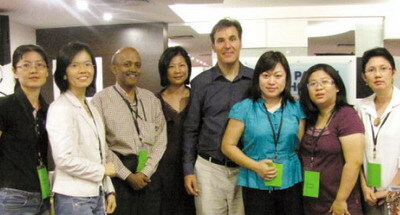 The association was registered last year in January 2009 with Datin Grace Lee as its patron. A year later in January 2010 the group started a school to provide academic education for children with autism. According to ASAP adviser Ms Michelle Cheng, children with mild autism can achieve academically. Some of these children have special abilities (autistic savant) in music and art and if developed can enable them to earn a living. Not doing anything for these children will most likely lead to their inability to live independently when they grow up. However their different styles towards learning make it difficult to adjust to the mainstream classroom. Hence the school was set up with a modified classroom and curriculum and teachers trained to deal with autistic children. Currently the school has two teachers and three students. They need teachers as they intend to take in more students. No two students are ever the same as some disorders vary from mild to severe. The severe students need to learn living skills such as communication and how to interact with others and not just academic education. These children need to be taught the skills needed to adjust to the real world. Since every child is different the school as well as the teacher will actually grow with the children. Of more importance though is the family’s involvement and the parents’ support group as the child spends more time at home. Through the association’s awareness programmes to educate parents of the methods and therapies to help their children, the parents as well as the teachers feel empowered when performing their job at hand. At the recently organised talk “Cognitive Education for the Autistic Child” by Roland Hifler, more than 80 participants attended. It was noted that 50% of the attendees were teachers from government schools while the rest were parents. Hifler is a pedagogue and therapist graduate of the Faculty of Psychology and Educational Sciences of Geneva University who has over ten years of clinical experience with autistic people. He is also the founder of an autistic children’s programme authenticated by Geneva University. He has very generously donated his time to share his experiences with the local community. I stay in KL and having a son with high-functionaing autism. I would like to know more about this school and possibly of visitng you and at the same time wondering if you may know if there is any school like this in KL or PJ? Appreciate for your kind support. I am not aware that this page existed and there are people trying to contact me or ASAP. I can be contacted at 012-5544282. I am ABA Therapist (USA) .My son is in the spectrum (mild) I have just arrived to kl .please looking for a school . I ll be happy to build a fruitful working relationship and help other children. Urgent need to find a good school for my 12 years old son. You can contact Michele at 012-5121897. My name is Abrahm Lee and I have a son Isaac Lee age 21 yrs old who is diagnosed as having Asperger Syndrome. As parents we wish to get in touch with you, as such kindly adv us your tel contact or address so that we can meet or call up to find out more in order to seek help for my son. You can try contacting ASAP committee member, Charlotte 016-4227076. Another option is Autism Asperger’s Help Association (AAHA), a non-governmental and non-profit association registered with the Registrar of Societies Malaysia. Contact: Dr Shan Narayanan (016-5914735), Mrs Michelle Cheah (012-5121897) or Mr Yee (012-5216348).